Yelling bells aside, I was so taken with this guy's work with truffles that I decided to make some myself. I've made standard chocolate truffles with ganache centers a few times before, but I decided, in the spirit of Sweet Genius, to amp it up a little. Peaches are summer incarnate. They're sweet, succulent, and beguiling in their various shades of blush and orange. Paired with a dark chocolate shell, these truffles are both fresh and decadent, to be savored slowly while watching the fireflies flit about profusions of Texas sage. Or, you know, jammed in your mouth in quick succession. Whateva. Peel the peaches. The easiest method to peel a peach is to cut a small X on the bottom of each peach with a paring knife. Heat a large saucepan full of water until it starts to boil. While that's going, prepare an ice bath. Once the water is boiling, carefully set the peaches in the water and let them sit in the water for one minute. After that, fish the peaches out of the boiling water and into the ice bath for a minute or two. Take 'em out, pat 'em dry, and then peel from the X on the bottom. The skins should come off with peachy-keen ease. Dice the peeled peaches and process them until you've got a smooth peach purée. Pour the purée into a saucepan and whisk in the egg yolks and sugar. Cook the mixture on medium heat for about 20 minutes, stirring constantly, until the mixture coats the back of a wooden spoon. Take the mixture off of the heat and whisk in the butter one tablespoon at a time. Chill in the fridge until it's delightfully thick and creamy. 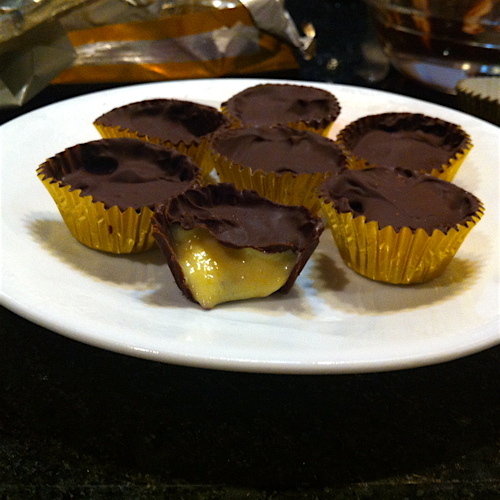 In a double boiler, melt the chocolate until it is smooth and glossy. With a paintbrush, paint the bottom and sides of the foil baking cups. Set them in the freezer for two minutes. After that, take them out and fill them halfway with the peach curd. Set them back in the freezer for two more minutes. Take them out and brush the top of the peach curd filling with chocolate. Put them back in the freezer or fridge until they're set. Note: As you can see, I made the rookie mistake of painting the foil cups all the way up with chocolate, which resulted in a very messy and hard-to-peel truffle. I would advise that you paint them maybe halfway or 3/4 with chocolate, so that you have a little more to work with when you're trying to peel off the foil.